You came into this life at this time for a purpose. You were perfectly created for the Divine mission for which you were appointed. You were gifted with all of the tools you would ever need. God put them inside you, deep down in your heart. Your number one task in life will be to realize who you have always been, who you truly are. You were sent to learn this truth, but you were, also, sent to teach and help those around you learn the truth of both your Divine Nature, as well as their own. Life is a lesson, a lesson on being and on becoming. You are both student and teacher. Oh, what a wonder, wonder you are. When you were born you began co-writing a book with God, a book about you. Pages are written day by day, and those pages will become chapters. There will be some pages you wish you had not written, but those pages are part of your story. There aren’t any mistakes, only lessons to be learned. As you learn to walk, you will fall down; but you won’t stay down, you’ll get back up. When you learn to ride a bike, sometimes you will fall and will have the scrapes to show it. But eventually you will ride your bike skillfully and the bruises will all heal. It’s all part of a learning process, and the paragraphs you wish you didn’t write, will serve a greater purpose in achieving your mission. Always remember to filter your senses through your heart. Your ears will help you hear, but it’s important to listen with your heart. Your heart will hear what’s behind the words that are said and will seek to understand another person’s point of view. Your eyes will help you see, but it’s important to see with your heart. Your heart will let you see beneath the surface to the Divine Seed that is within everyone. Your tongue will help you taste, but it’s important to taste with your heart. Your heart will allow you to taste the sweetness of love and spit out the bitterness of hate. Your nose will help you smell, but it’s important to smell with your heart. Your heart will smell the aroma of equality and refuse the stench of supremacy. Your fingers will help you touch, but it’s important to touch with your heart. Your heart will let you touch the life of another in a way that will change their life. God isn’t scary or angry. God is love, warm love. God is light, pure light. God is laughter, contagious laughter. God is the smile that makes you smile. When you uncover the reality of your nature, you will discover that God and you are one. Inseparable. Indivisible. You always have been, and you always be. Click Here to see the video Rev. Chris opened Sunday's message with. Unity Church is about spiritual development. We aren’t a traditional religion; the world isn’t seeking more traditional religions. Yet, many are truly hungering to experience God. You are a spiritual creature, and you are likely reading these words because you have a desire to grow and expand spiritually. Is it okay to have questions about God? Well of course! Look at the word “question,” and you will see the word “quest.” A person who asks questions is on a quest, a journey. Children ask questions because they want to understand. There is no quicker way to stunt your spiritual and intellectual growth than to stop asking questions. I love the three letter word “why,” and my heroes are those who have swam upstream rather than merely accept handed-down answers. In this article, we will briefly look at two questioners: Jesus and Thomas. In Luke 2, Jesus’ family had gone to Jerusalem to celebrate the Passover. While on their way home, they realized Jesus wasn’t with them. Yikes! How would you like to be the parents who lost Jesus? Frantically they searched for him and found him three days later in the temple, “sitting among the teachers, listening to them and asking them questions” (vs 46). (Perhaps Joseph and Mary were the first two people to “find Jesus.”) The Scripture goes on to say, “Everyone who heard him was amazed at his understanding and his answers” (vs 47). How did Jesus amaze them? Was it some kind of Torah trivia game? Or, does understanding imply something deeper than mere rote memorization? I think it’s fair to say Jesus had a profound awareness of God from a very early age. Yet, even he had to grow, mature, and develop (vs 52). Thomas is my favorite of the apostles. He’s been referred to as “Doubting Thomas” throughout the ages. However, I find him the most honest of the 12. One time Jesus was giving a speech about how he was going away but one day the others could join him where he was. Thomas interrupted Jesus and burst out, “We don’t know where you are going, so how can we know the way?” (John 14:5). Thomas didn’t get it. He didn’t understand. So, he questioned. Not only do I not find fault with Thomas, I identify with him. Think of it this way. You only ask questions if you care. I do not understand Algebra, and I do not care enough to ask questions. I do not understand how a car runs. If the vehicle gets me from Point A to Point B, that’s all I care to know. I will not research manuals or ask mechanics or engineers any questions. Why? I don’t care. However, when it comes to spirituality, I am full of questions. Why? Because I care. Because I am on a journey. And, chances are, if you’re still reading, you care, too. There is some part of you that is on an honest spiritual quest. In John 20, Thomas is told that Jesus, who had been put to death by crucifixion, was alive again. Thomas didn’t believe them. Do you blame him? What do you call people who believe everything they are told? Idiots. (That’s what I call them, but you’re probably kinder than me.) Thomas was unwilling to believe something just because someone else said it was true. I admire his desire for a first-hand experience. His questioning was not a sign of weakness, but of character. 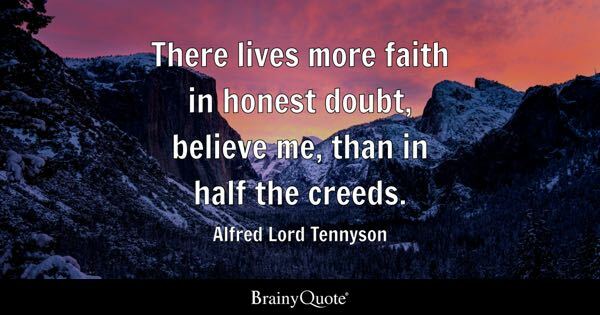 “There lives more faith in honest doubt than in half the creeds” (Alfred Lord Tennyson). Religion to liberate humanity I admire. Religion as a means to control humanity I abhor. Discontent with having been instructed by all of the wisest spiritual teachers to simply love others as you love yourself, our ancestors and our friends today want rules. With rules comes judgment about who is a good rule keeper and who isn’t. With judgment comes pride, fear, and condemnation. For condemnation to be effective, guilt, shame, and punishment are required. The time to break the chain of judgmental control is now. It’s the love revolution. You were not created to live in chains. You are the image and expression of God, and God is Love. This truth will set you free. Jesus was a revolutionary. His spirit of rebellion brought him into constant friction with the religious authorities. He spoke against their hypocrisy and rule-keeping self-righteousness. He said ‘enough is enough’ to the idea that a person should not experience God to such an intimate degree that he or she could not say, “I and the Father are one.” Jesus was a liberator, a chain breaker, and a perennial lover. He calls those of us who would walk in his footsteps to join the love revolution. The first order of business is to love yourself. Love yourself enough to set yourself free from old ways of thinking that are no longer serving your highest good. If necessary, enumerate your grievances on paper against the limiting or damaging government of wrongful thinking and sign your declaration of independence. Love yourself enough to truly forgive yourself and all others. Do it for you. Love yourself enough to set yourself free from all chains of addiction. Love yourself enough to meditate and fully embrace the Divine Presence within you, who is you. The “shot heard round the world” in the love revolution is fired when you make an honest commitment to love yourself and allow yourself to be all that you can be. “Infuse your life with action. Don’t wait for it to happen. Make it happen. Make your own future. Make your own hope. Make your own love. And whatever your beliefs, honor your creator, not by passively waiting for grace to come down from upon high, but by doing what you can to make grace happen…yourself, right now, right down here on Earth” (Bradley Whitford, actor). What is it I want to do? I rewrote the following paragraph and replaced “I want,” with “I am.” I am a preeminent preacher of love. And what makes me a preeminent preacher of love? It’s because I hold love to be all preeminent. I am the apostle of love and the evangelist of love. With love, I am a bridge-builder and a wound healer. I am a link between prejudicial division, past or present, in whatever form it has manifested. I am standing on a solid rock with outstretched arms, for I stand upon the rock of love. I am the gentle and gracious father/mother who in the name of unending love calls all of my children to feast at my table, and everyone I see with either my eyes or my mind is my child. I am a catalyst for change in your life, for I love you as I love myself and I affirm your highest and noblest good. Do you remember the words from this popular song? “What the world needs now is love, sweet love, It’s the only think that there’s just too little of. What the world needs now is love, sweet love, No, not just for some but for everyone.” The world, truly needs to be flooded with love. Let’s make it happen. Let’s start a Love Revolution. Meditation does not need to be taboo or a practice only for gurus. This morning I simply closed my eyes and purposefully breathed in Divine Love and exhaled Divine Love. I mentally pictured my sleeping wife and daughters receiving the Divine Love I breathed out. I pictured my son who's three hours away receiving the Divine Love flowing in and out of me. I concentrated and found my heartbeat. If my heart is going to beat, let it circulate Divine Love. I then consciously breathed love to all the members of my extended family and my church family (past and present). Then I dared to enter that space where I breathed the Divine Love freely given to me by the grace of Spirit into the lives of those whom I perceive to be my enemies. As I breathed Divine Protection upon them, they didn't look like enemies anymore. Naturally, my mind wanders when I do this. When it does, I simply bring it back to my inhaling and exhaling Divine Love. Before opening my eyes, I pictured the few of those who might read this post as being charged with the positive energy of knowing someone breathed a Divine Blessing he couldn't create but could merely pass along into their hearts. I encourage you to take just five minutes and practice this simple meditation exercise. What If God Is Bigger Still? On Sunday, January 19th Rev. Chris shared with us a beautiful poem he had written especially for our congregation. As his first blog post he is sharing that here on our website.